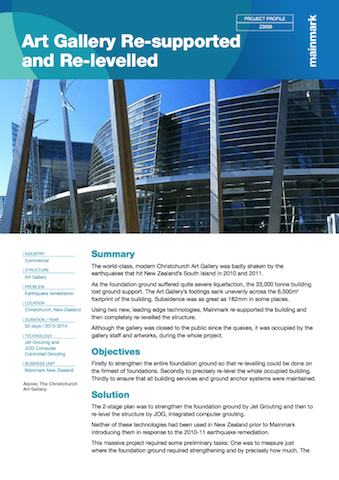 During the Christchurch earthquakes of 2010 and 2011, the Christchurch Art Gallery suffered significant damage to its foundations, causing the 33,000 tonne building to sink. Mainmark worked closely with the project’s engineering team to successfully re-support and re-level the 6,500 square metre foundations in just 52 days, without requiring excavation or the occupants and exhibits to vacate. The force and stress of the earthquake liquefied the ground under the gallery’s foundations, causing the building to sink differentially across its 6,500 metre footprint. 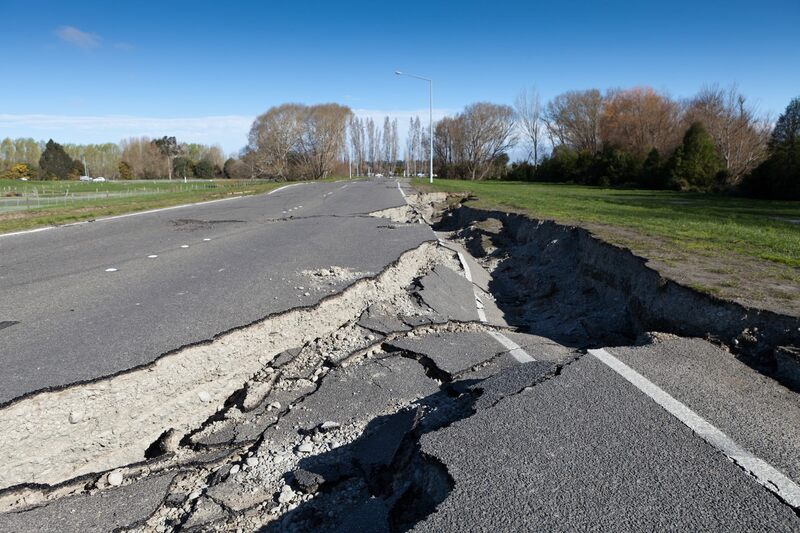 In some areas, the subsidence reached up to 182mm. 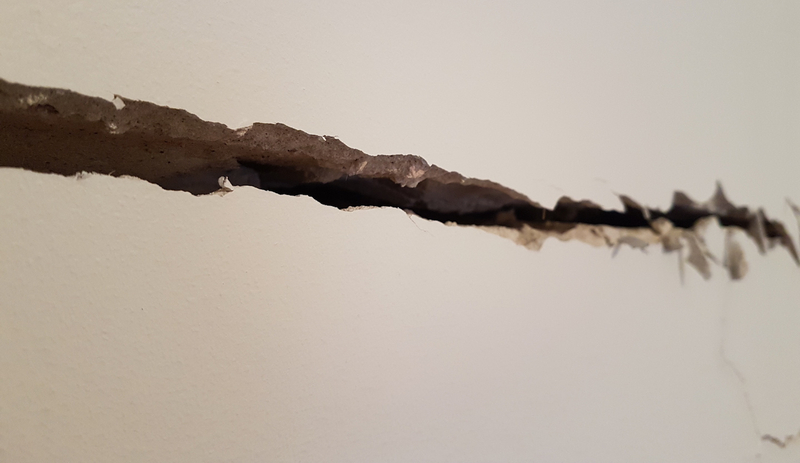 Foundation repair was necessary; however, it had to be completed without disrupting daily operations. The gallery was still occupied by staff and housed valuable artworks, so building services and ground anchor systems needed to be maintained. The challenge was two-fold. First, the sub-soil had to be stabilised to create a reaction platform, then the building re-levelled. Prepare the foundations: Working with council and Aurecon engineers, we used Trimble billion-point plotting to map the foundation in minute detail and pinpoint where it required strengthening – and by precisely how much. Comprehensive 3D models of the building identified the areas of dilapidation and provided benchmark data for monitoring progress. We installed an automated wireless robotic survey system to monitor foundation levels at various points, allowing the team to access real-time data while the project was underway. To accommodate the high water table, the project team also de-watered the building. We modified building services and disconnected 72 deep ground anchors. Strengthen the foundations: Mainmark installed124 jet grout (or Jetcrete) columns under the gallery’s critical load points to stabilise and strengthen the foundation soil. Created through penetrations of just 200mm, the columns were between three and four metres in diameter and up to six and a half metres deep. The solid, deep-soil reaction matrix was created with minimal mess, as we continuously evacuated excess slurry and water. Re-level the foundations: The Mainmark team then used JOG computer-controlled grouting to re-level the gallery by injecting grout over 44 days, which required 22 staff on an average day. There was no excavation or vibration. 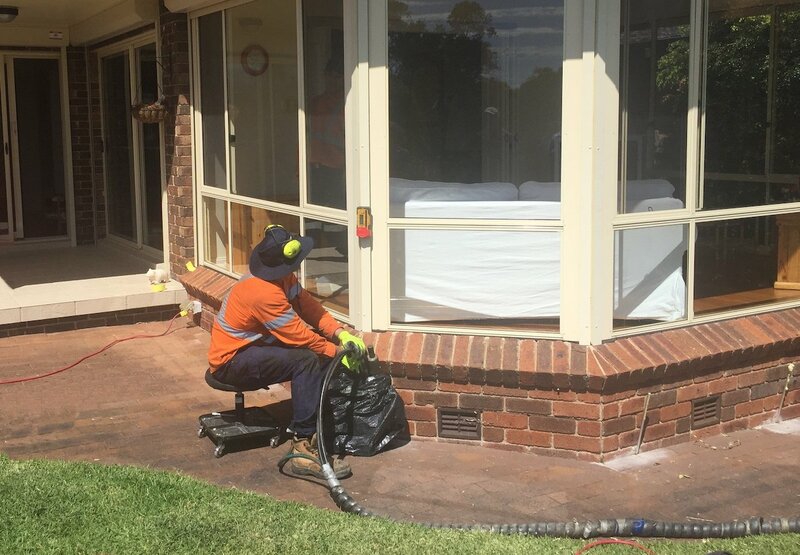 The system uses high pressure, low volume grout pumps to deliver cementitious grout through 12mm lines to a number of grout monitors in a ‘daisy chain’ formation. The JOG method controls grout injection using computers for extreme precision. Controlled to the millimetre, we lifted the gallery an average of 2mm per day, with lifts of up to 182mm required in some areas over the course of the job. This used 1.5 million litres of injected grout. To conclude the project, we filled and waterproofed the jet grout and JOG penetrations in the basement, re-instated building services and re-connected ground anchors. By Andrew Masterson Andrew is the Business Development Manager at Mainmark New Zealand. 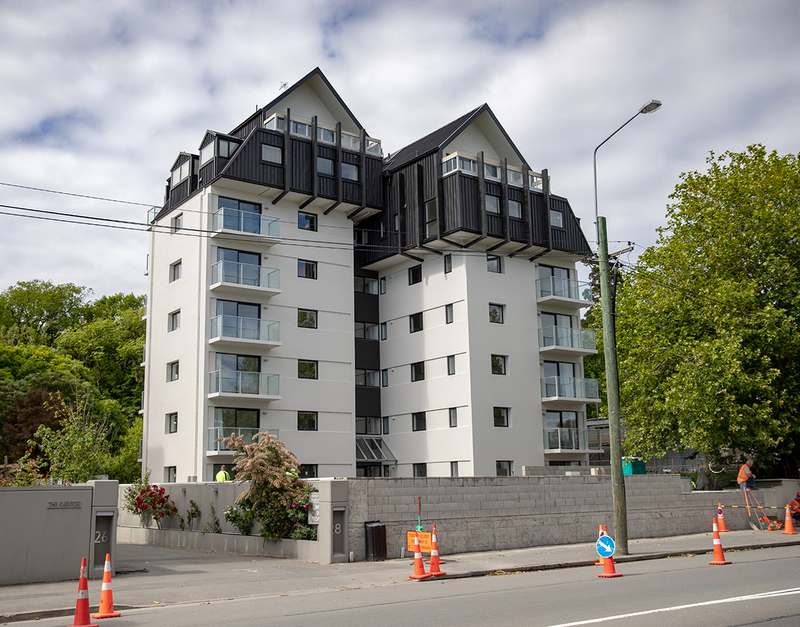 With 28 years’ experience in the New Zealand construction and civil engineering industry, he has intimate knowledge and broad experience with Jet Grout and JOG Computer Grouting.